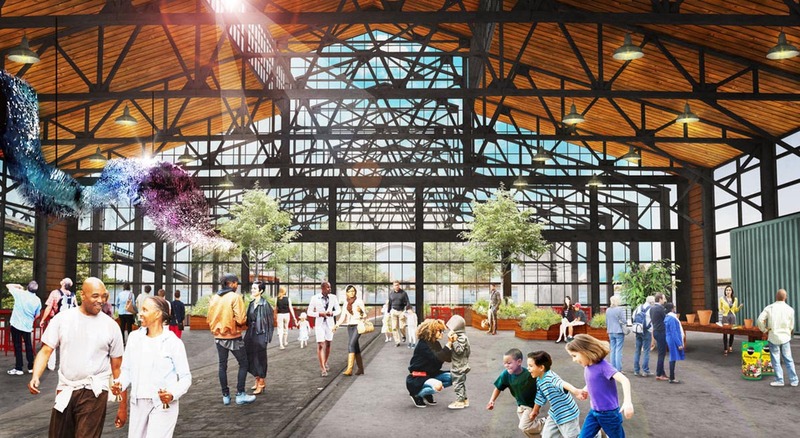 Downtown Philadelphia will debut its newest cultural space this fall: an unlikely arts venue, marketplace, bar, and public park set inside a converted 99-year-old maritime warehouse. 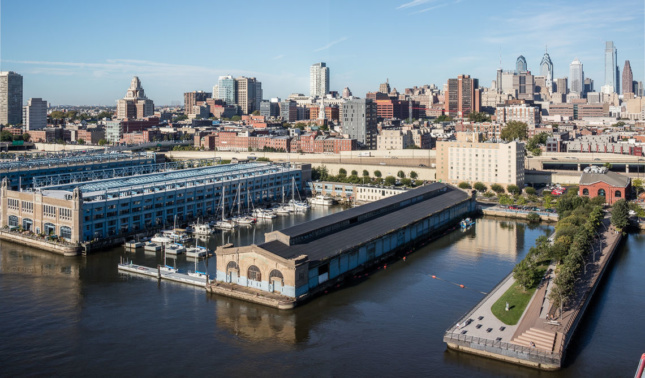 Cherry Street Pier, designed by Groundswell Design Group and Interface Studio Architects, will open on October 12 at Pier 9 along the Delaware River. 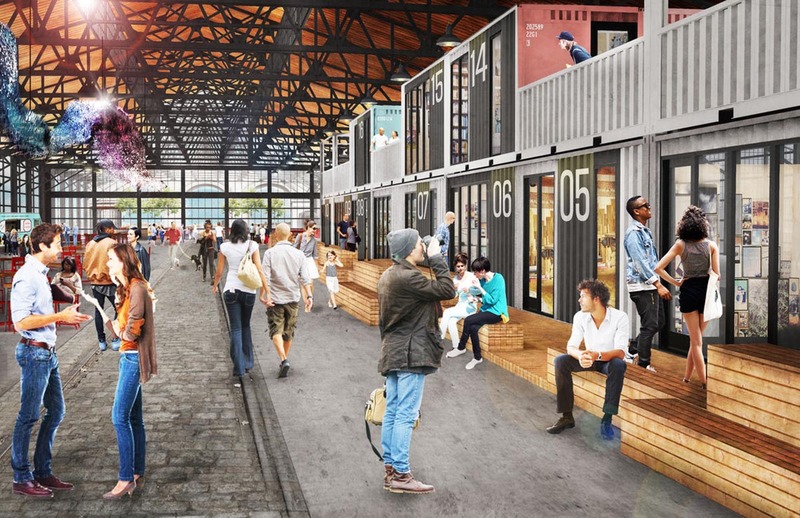 The $5-million project will transform the 55,000-square-foot municipal structure into a mixed-use waterfront destination and studio facility for 14 local artists. 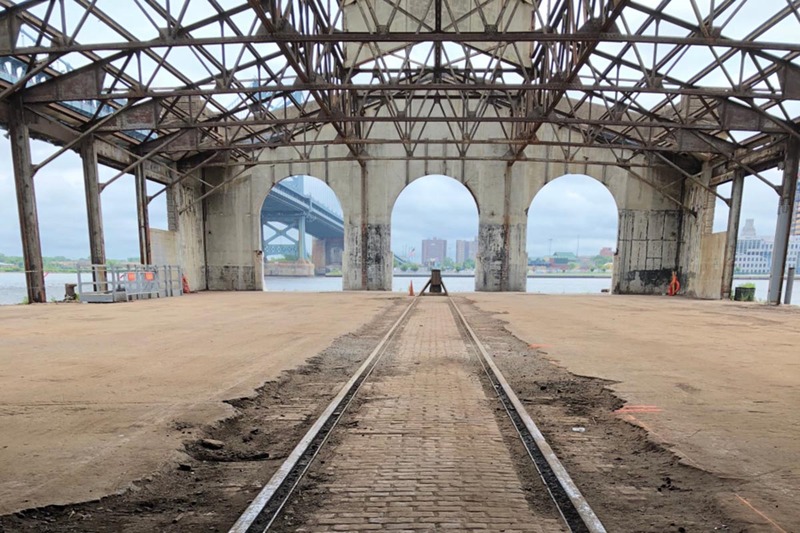 Located south of the Benjamin Franklin Bridge and the Race Street Pier, the long-neglected, 19th-century building has undergone major renovation work over the last year. The project, dreamed up by the Delaware River Waterfront Corporation (DRWC), aims to introduce a new space for civic engagement as well as a collaborative home for the city’s visionary artists and entrepreneurs. 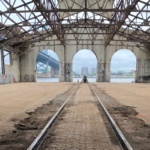 The group announced Wednesday that the park will open ahead of the three-week arts celebration, Festival for the People, put on by the Philadelphia Contemporary. 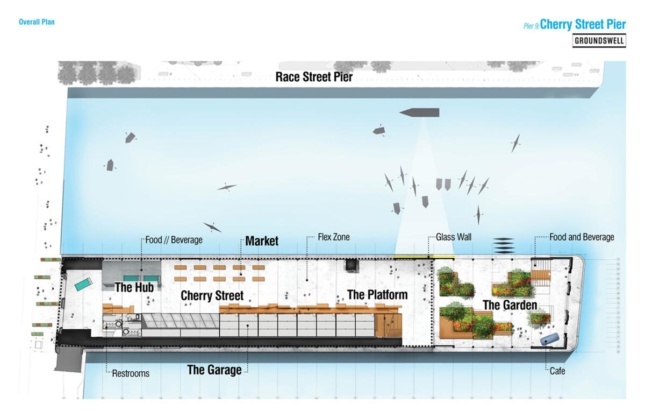 According to Philly Magazine, DRWC president Joe Forkin said that the Cherry Street Pier will serve as a foundation for the arts to flourish along the city’s waterfront. 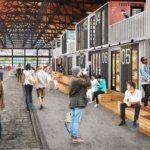 The historic building will house affordable studios and offices for emerging artists within repurposed shipping containers featuring glass walls. Community members and visitors to the dock can peer inside the studio spaces—dubbed the Garage— and watch the artists at work throughout the day. Tenants will be able to showcase their art in a 10,800-square-foot open space dedicated to large-scale art installations and performances. The site will also include room for a pop-up retail market, public events, and food vendors. A café and bar are being built for the open-air garden at the edge of the facility. 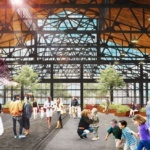 The architects will peel back the roof of the warehouse in this section, exposing the steel trusses and stone masonry to reveal the historic structure’s core and unveil a unique perspective of the river. Wood benches, railings, plants, and trees will fill the space so people can relax and enjoy one another’s company.